If yesterday's stretched Willys wagon was a little too normal and complete for your taste in weird custom vehicles, today is your lucky day. Behold the Stude-amino, a custom Studebaker unlike anything you've ever seen before. This twenty four foot long entry to custom project car hell is currently for sale on Ebay. Even though using different parts for custom cars is fairly common practice, we are willing to bet there have been few weirder combination of parts than this Stude-amino. 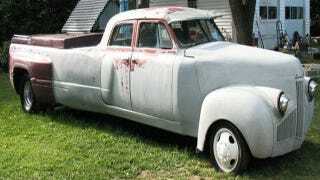 Based on a one ton Chevy truck chassis, the body of this strange creation is the mixture of a 1946 Studebaker Truck tilt front end and a Dodge dually truck bed with a 1950 Studebaker Champion body in between. Truthfully, we aren't sure if this is a car or a truck or a combination, but since Stude-amino sounds so good, we are running with it. According to the Ebay seller, despite the Stude-amino's rough exterior and lack of interior the truck "runs excellent". In this context we are going to take that to mean the 454 V8 under the tilt hood runs, because the pictures don't give impression of a vehicle that has seen the road anytime recently. Although the truck "only needs interior and paint", the thought of what kind of "custom body work" lurks beneath the Stude-amino's primer gray exterior is a slightly terrifying thought. Appropriately enough, it is not until the last line of the auction the seller mentions the first of many obstacles the future owner will encounter after purchasing the Stude-amino; shipping it home. It turns out the truck is an amazing 24 feet long with a whopping 19.5 foot wheelbase, which should result in some amusing and expensive phone calls to car transporters. While the price of acquiring this bizarre diamond in the rough isn't revealed anywhere in the Ebay auction, bidding is currently at $880. Where it will stop is anyone's guess, but we're going to say the best way to rationalize the purchase of the Stude-amino is likely going to be price per pound.